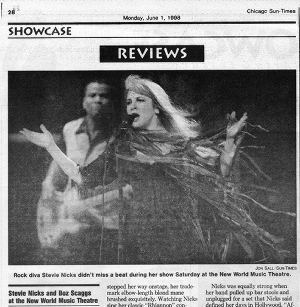 Stevie Nicks did everything right Saturday night at the World Music Theatre that she did wrong last November at the Horizon with Fleetwood Mac. The endlessly blond rock diva muscled into upper registers that were only rumors for her last year, whirled and twirled unencumbered by ancient feuds and ambivalent band mates, glided across the stage visibly thrilled to be emancipated from another greatest-hits set list. Turning 50 appears to have lit a fire under those 5-inch heels and rivers of flowing shawls. Wrapped in a lacy antique black dress and adorned with wispy layers of earth-toned scarves, Nicks baby-stepped her way onstage, her trademark elbow-length blond mane brushed exquisitely. Watching Nicks sing her classic ``Rhiannon'' convinces even the most rational skeptic that she'd lose her voice if you cut off her hair. Touring to promote a new retrospective CD box set, Nicks sounded innocent, even nervous as she told the crowd that she intended to perform some songs she'd never sung onstage before. Where Nicks appeared drained and weary last November with Fleetwood Mac, she looked radiant at the World, as if she were auditioning for a gig with a band she'd been dying to join. That edge made the evening. ``Enchanted'' rollicked behind Nicks' throaty push and playful phrasing. The art of sultry tambourine shaking begins and ends with a study of Nicks in this kind of uptempo groove. Nicks was equally strong when her band pulled up bar stools and unplugged for a set that Nicks said defined her days in Hollywood. ``After the Glitter Fades'' was gently sung and smartly phrased, Nicks easing in and out of verses like a mom checking on her sleeping kids at midnight. Equally important, Nicks took time to explain her song choices to an audience that obviously adores not only her singing, but her image. With Fleetwood Mac, Nicks was in no position to personalize a set the way she did Saturday at the World. Mac fans did not go home disappointed. Nicks worked classics ``Gold Dust Woman'' and ``Dreams'' with enough spin to advance them the 20 years since ``Rumours'' ruled the nation. But the real treat was in her energy; even at 50, Nicks is timeless when she sings what she wants to sing. Thanks to Greg Lebrick for sending this article to The Nicks Fix.